> > highly competitive markets are spending effort on useless product changes? None of your post provided any other real evidence or logic. > > How easy do you think it is to double floating point performance? > easy, if your FPU is small compared to the rest of the core, it is also cheap. 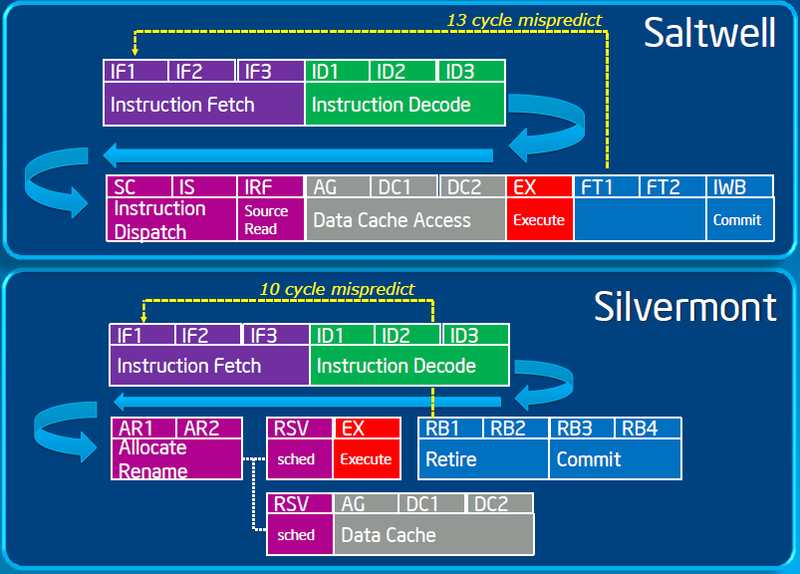 Intel doubled SIMD width in SandyBridge and had to redesign the pipeline to be PRF-based. So you think going to a PRF was pretty easy change? > > on the other hand say "doubling floating point performance is easy and cheap". > I didn't say that, anyway. Words to that effect. I was paraphrasing. > > not Intel have added huge floating point performance to Silvermont? Answer that. > Ask Intel, Silvermont is a rather small core, a FPU that is small on Haswell may be quite big on Silvermont. > > It costs depending on how much you put on, and how you measure the costs exactly. > I think everybody understood you were sugesting a big L4. No, you can have a memory latency benchmark which fits in L4. Or a particular workload which just manages to fit. On a smartphone, you probably don't have a lot of apps where the working set is hundreds of MB. > > Implementing floating point performance that you find in A15, for example, is not "free or very cheap". > Well, do you have a die shot? No, why should I? Do you have any die shots for your assertion that it is free or very cheap? > > little A7 core in one corner to run the OS, and dedicate the rest to a GPGPU array. > horrible integer performance, that's exactly what Linus were arguing against. But you said that designers and consumers prefer to pay for things which are not relevant to their workloads. If high FLOPS is one of those things, moving to a GPU-like core would be a cheap way to win useless benchmarks.